T.N. Bala hails from Tiruvayyaru in Tanjore Dt, India. He is one of the very early disciples of the late Ganakaladhara Madurai Mani Iyer. A professional Broadcaster, artist and executive in All India Radio in Chennai and Delhi, years after his Masters in Journalism and Economics, he migrated to the United States some 52 years ago after being selected to join the Broadcasting division of American Radio and Television. With his love for music, Bala has been actively involved in promoting Carnatic music in the United States. 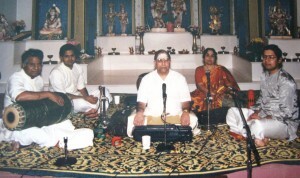 Besides performing he has trained many music groups in the PA,NJ,DE Tri-State area for over 20 years, who have distinguished themselves by their exceptional rendering of musical master pieces such as Dikshithar’s Kamalambal Navavarana Krithis, rare Avayambal Navavarana Krithis, Navagraha Krithis, Thyagaraja Pancharathna Krithis, Andal Thiruppavai, Thiruppali Ezhuchchi, Arunagirinather’s Thiruppugazh – to name a few. Besides a vocalist, Bala is also a percussionist, playing on mridangam and kanjeera. He has accompanied many artists like Maharajapuram Santhanam, TV.Sankaranarayanan, D.K. Pattammal, D.K. Jayaraman, M.L. Vasanthakumari, Mandolin Srinivas, Trichur Ramachandran, to name a few, both in India and abroad. Among other things, Bala is a reputed composer. One of his compositions “Vilayada I dhunerama”, in Shangumugapriya, was made a household name by the late Maharajapuram Santhanam. Subsequently, vidwans like D.K. Jayaraman, Trichur Ramachandran, B. Rajam Iyer, Santhanapopalan, T.R. Subramaniam, Sudha Raghunathan, R. Ganesan, Sangeetha Swaminathan, Mandolin U Srinivas, tonam e a few, have presented here and there some of his compositions. Bala has published two books, both released in Chennai in 2003 and in 2006, at Mylapore Srinivasa Sastri hall. TRS, along with Late Sulochana Pattabhiraman, released one of them while the other was done under the auspices of TK Govinda Rao. The late Vainika vidwamsini Vidyashanker was of immense help in the presentation. These musical stalwarts are all in praise of Bala’s Ishta deivan, Sri.Murugan. You can hear some of them on Youtube under the name “tnbala”. His “Muruga Pancharathanam”, tamil tribute to Lord Subramania was staged in Chennai as well as in the Cleveland Aradhana by a professional music group in April 2008. The Tamil Nadu music college undertook to teach them to students in 2006. His expertise extends beyond the realm of music and into the areas of film making, videography and lately in electronic and digital music. He is well known among the Indian Community through his longest Indian Radio program Magazine India, and a Bi- monthly TV Program, entitled “Image India”. T.N. Bala has received many awards over the years besides being recognized for his outstanding services in the field of Carnatic Music. In 2004, Bala became the only Indian recipient of an award and grant from the Philadelphia Chapter of American Composers Forum to produce his original Carnatic musical creation. 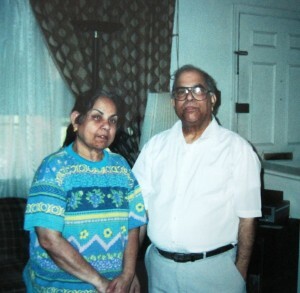 Bala is now 84 years old and lives in a quiet and serene surrounding in Havertown, a suburb of Philadelphia, PA. Bala was married to B.Susila who passed away in 2003. She was his moral and vocal support. She had her musical training under him, and rendered vocal support and Thambura accompaniment. Mother of three sons,( a lawyer, a computer engineer and an electrical engineer), she hailed from Mayuram of Tanjore Dt. I met Sri T.N. Bala (who I know as Bala mama) when I was eight years old. He was the most recognized and experienced music teacher in the Philadelphia area, and my mother and father were both members of his vast network of students. At the time, my parents had been trying to get me more involved with music, and I think they figured that because I was always humming or singing along to music on the radio that learning to sing was the right direction for me. 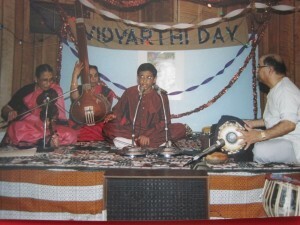 I was pretty young at the time and didn’t have very strong feelings for or against learning music, so my parents enrolled me in a class with one of Bala mama’s junior groups that already had four other students: Sandhya, Shilpa, Chethan, and Nikhil. Initially, I had to do a bit of catching up, but the five of us gelled pretty quickly. Bala mama took us through the ABC’s of South Indian Classical music. For five years, until I was nearly 13 years old, the group learned to sing swara exercises, geethams, swarajatis, varnams, and a number of Krithis. His curriculum was straight out of the most recognized traditions of carnatic music, and his style of teaching was very much colored by his multi-disciplinary prowess in singing, percussion, harmonium, and composing. Bala mama had the resume of the consummate teacher: he studied with the best, he had performed extensively in his life, he had experience in teaching many students, and he was a musical being to the core. As a teacher, Bala mama was a perfectionist. He often spent a great deal of time forcing his students to repeat lines until they sounded exactly the way he taught them. He extended this meticulous attention to detail to his script preparation as well. All of the notation that we used in class was carefully organized, type set, and photocopied when we came for class (much of the sheet music for Indian Classical music varies widely between different schools of musicians and was certainly not readily available online 15-20 years ago). These components of his teaching style were no doubt some of his fundamental strengths. There were subtle points which I believe made mama unique from other Carnatic music teachers. Bala mama used to teach behind his harmonium. Before we started any song, mama would sing various permutations and arrangements of the underlying swara (notes) behind a raga (scale/key), and he would ask us to repeat while he played his harmonium. In fact, I don’t remember an occasion in which he ever started a song without asking us to sing various passages from the raga. When I teach my own students, I continue to follow mama’s tradition by developing the raga with rhythmic and tonal exercises. Often during class, mama would pick up his kanjira (a single faced South indian percussion instrument), and either accompany us or sing with us while playing. Some of the more entertaining occasions were when he would be singing and playing at the same time, and we couldn’t even deliver one sangathee (musical line) properly. Mama’s habits helped to develop a lot of our ears and rhythmic reflexes early in life. During class, Bala mama’s wife Susila aunty, would accompany us after mama taught a line. She was a good singer herself so hearing her would help us to deliver the sangathees properly. It’s funny to recall how often it was our turn to sing, and we would look at Susila Aunty in the hopes that she would start singing before we did. Susila Aunty used to sit behind Bala mama during his own concerts, but she also sat behind his students when they performed. Between mama’s teacher day programs every year and the host of local association music festivals centered on composers (Thyagaraja Aradhana, Dikshitar Day, Composers’ Day, etc), mama’s students ended up singing in public a lot, and Susila Aunty was always there. Bala mama is, of course, a well known composer (his most famous composition is probably that which was first popularized by Maharajapuram Santhanam entitled, Vilayada Idhu Nerama in the raga shanmugapriya). Many people don’t know this, but in addition to his many compositions, mama has also composed chittai swarams (intermediate passages (often highly rhythmic) that occur between two sections of a krithi) for many famous krithis, and he has passed along these swarams to all of his students. Now, all of us who learned from him still sing/play his chittai swarams, and those of us who teach have passed his swarams on to our own students. When I was 13 years old, Bala mama asked me to bring my saxophone to class. At the time, I had just started to play the alto saxophone in my middle school band, so I didn’t know much about the instrument. 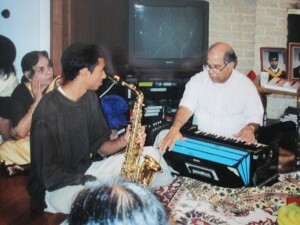 Bala mama was very excited, and for a few months, he took to teaching me carnatic music on the saxophone. Neither of us had the technical understanding of the instrument to develop my repertoire very much, but the musical knowledge was there on mama’s side, and he figured that I could pick up some technique on my own, and he could mold me into a solid player. It was shortly after this period (around 1997) that I met Dr. Kadri Gopalnath who had the technical savvy that I was missing in addition to iconic success in Indian Classical music. From that point onward, I was in very capable hands between my two gurus. 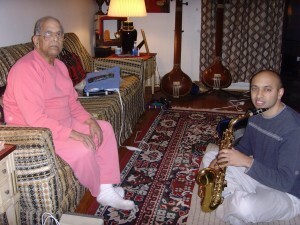 For a few years after I started to play the saxophone, Bala mama taught me music on an individual basis as well. Some of the best lessons I remember having with Bala mama were on a one-on-one basis. By the time I was 16 and working with him, at least half of our classes were dedicated to his singing raga alapana and my attempting to accompany and repeat him. The constant challenge in playing carnatic music on the saxophone is attempting to replicate a vocalist’s gamakam (oscillations and ornamentations that mark the essence of all Indian classical music). At its roots, carnatic classical music is a vocal art form; instrumentalists try their best to mimic what the vocalists do and then add new musical precepts and phrasings that are advantageous or unique to their specific instrument. One of the problems with trying to mimic Bala mama on the saxophone, however, is that it’s REALLY HARD! Bala mama sings with a heavily ornamented style that is often slower in pace and highly ornamented with gamakam (one of his own compositions in the raga mohana kalyani is a good example and can be found on youtube:( http://www.youtube.com/watch?v=lE4slP3s-zQ). 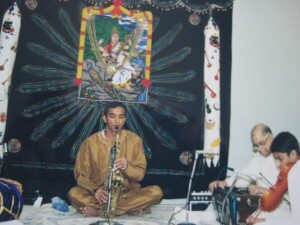 This style, which goes back to the great Madurai Mani Iyer (one of mama’s gurus and a giant of carnatic music in the 1940’s and 1950’s), is extremely challenging on the saxophone; every oscillation, nested grace note, interval slide, and note articulation requires a combination of finger and embouchure (mouth piece grip) manipulations that is both physically taxing and conceptually difficult. Often times, my goal in sitting with mama was to play about 20% of what he was singing exactly as he sang and then try to soak up the rest of his ideas so that I could mold them into something that could be more reasonably delivered on the saxophone. Today, I don’t know anybody who sings the way mama does, and there are very few direct disciples of his gurus’ generation of music left. 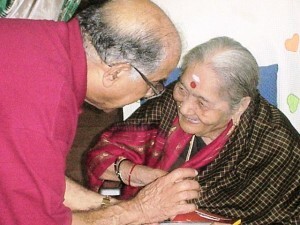 Bala Mama passed away in May of 2012. He is a person that is always with me. I remain a student and teacher of Carnatic music with a great devotion for this wonderful man, and I count myself as lucky to have had him in my life.